Equity futures are down substantially this morning with the DOW all the way back down to just above the 10,000 area. The dollar is higher, while the Euro made a new low overnight. Bonds are higher, oil is lower, and gold continues higher against the rest of the commodity complex signaling underlying trouble in our monetary system and geopolitical instability. Unfortunately, it was a very memorable Memorial weekend… BP’s “topkill” failed and their stock is down 14% this morning. Israel boards activist ships in international waters, 9 activists die. China’s economy continues to show signs that the bubble is bursting, Europe continues to show debt stress, while Korea tensions remain high. Of course no change to the fundamental debt picture and so while these may sound like transitory events, they are not, they are just the beginning of the “other” events that will likely continue to ripple around the globe – the underlying tension is a money system that doesn’t work… the bad math of debt allows other events to rise. June 1 (Bloomberg) -- The biggest monthly drop in the Standard & Poor’s 500 Index since February 2009 is ratifying Mohamed El-Erian’s prediction for a new normal of below-average returns. Analysts say not so fast. Combined price estimates from more than 2,000 forecasters tracked by Bloomberg show the S&P 500 will rise 25 percent in the next year, the fastest projected rate since February 2009, data compiled by Bloomberg show. The rally above 1,350 will be led by industries most tied to the economy, according to analysts who boosted individual share projections by an average of 0.9 percent in May, the 14th straight monthly increase. The estimates show Wall Street firms are discounting El- Erian’s assertions as well as Europe’s credit crisis and instead focusing on economists’ growth projections, which call for U.S. gross domestic product to expand 3.2 percent this year and 3.1 percent in 2011. Analysts are telling investors to buy landlord AvalonBay Communities Inc. and tractor maker Deere & Co. to benefit from the fastest expansion in six years. The S&P is forecast to rise 25% next year? LOL, will that be after it falls another 50%? To me this type of statement is proof positive that bearish extremes are not anywhere near. By the way, the monthly drop in the DOW was the largest May drop in 70 years! It was the largest May drop in the S&P going back to 1962. "Sure," say the bulls, "but the next two months that follow were average up months." That's exactly the type of thinking that occurs when you don't understand the underlying fundamentals. ZeroHedge ran an article this weekend stating that the ECB has been withdrawing the liquidity, now 78 billion Euros, it recently placed as a part of that trillion Euro bailout. It would seem that they are pandering to the markets which reacted quite negatively to the bailout. That type of flip-flopping will not calm markets, it shows that they are grasping at straws and don't understand the fundamentals or psychology at play. Manufacturing ISM and Construction spending are released later this morning, the big report of the week will be the Employment situation released on Friday. Speaking of employment, HP just announced that 9,000 more layoffs are coming. Below is a 60 minute chart of the SPX. 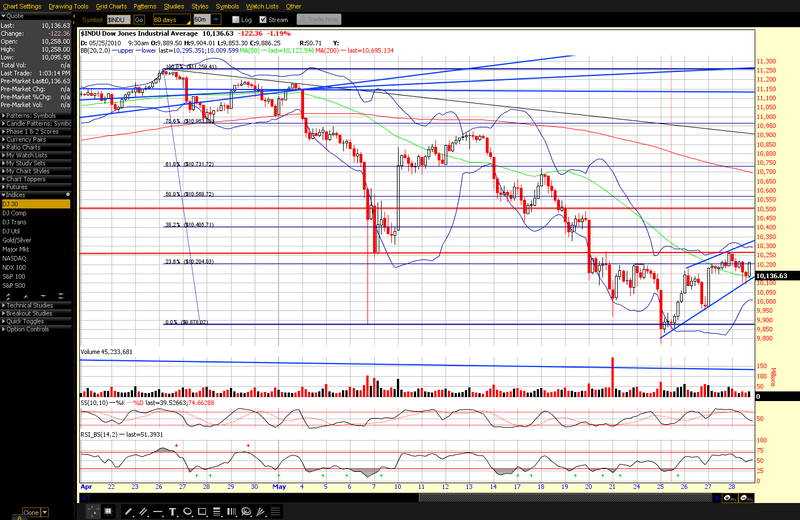 To me this now clearly looks like we just dropped out of a rising wedge that was wave 4 and that we are now in wave 5. Together, the five waves comprise the larger wave 1 down. Rising wedges when broken to the downside usually target the base of the wedge at a minimum, thus I would expect prices to fall at least to the prior lows and probably to new lows on this wave. 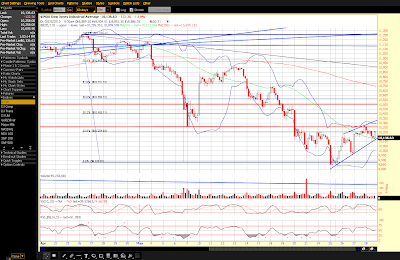 If the wave 5 scenario is playing out, we should get a wave 2 of 5 bounce and then more sharp selling. Wave 5 would be followed by a significant and longer lasting bounce for a larger wave 2. Keeping mindful that there are always other possibilities, it’s also possible that the rising wedge is not wave 4, and that it’s the ‘a’ wave of an a,b,c. I personally don’t like that count, but it’s there. If that’s playing out, then we will rise up into the 1,140 area sooner, that move will then likely be followed by a larger wave 3 down movement. SPX 1,090 is still a key level. Get back above there and it's more bullish, otherwise bearish. There's support in the 1,056 and then 1,040ish levels. A break below that 1,040 level will trigger what looks like a larger Head & Shoulder's pattern - we may need more time to fully develop the right shoulder, but it doesn't have to be proportional time wise. It may be that we develop a more complex movement that takes us up to 1,140 and that would make it more proportional.